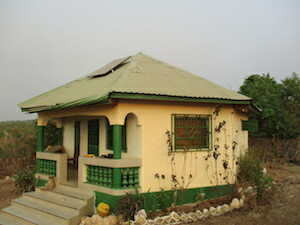 Solar Power makes huge sense in Africa with reliable and strong sun hours. Electricity is very unreliable in Guinea and holds back all sorts of bread-winning and educational activities. 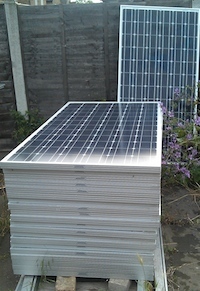 So in 2014 we researched and worked with the UK firm Nu-Vision-Energy to find the best off grid solar equipment. 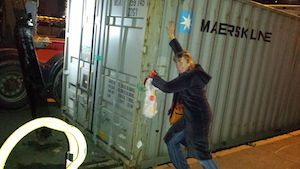 We fundraised and sent container end of 2014 arriving beginning of 2015. In April 2015 we worked with local solar electrician to install the latest highly efficient system with various performance enhancing appliances. There are 16 panels, a battery bank of 6 paired solar gel batteries, a smart charge controller, inverter, battery monitor, a back up generator if demand is high and for safety Fusebox & and ground wire. We also worked with the local solar electrician to install 6 small systems we brought to help local people and small businesses. They paid the cost and received a high quality most up to date functional electricity production. This helps to generate economic activity. Amongst the receiver were: a small local general shop, a local pharmacie and a local musicians collective.